Posted by bessie on Wednesday, May 20, 2009. Brighter Planet is dedicated to engaging people in the fight against climate change. From the individual to the Fortune 500 company, we believe that all must participate vigorously in the development of a more sustainable future. The world faces unprecedented challenges in the 21st century, from global climate change and biodiversity loss to resource depletion and mounting population pressures. Never before has the need for reduced environmental impact and socially responsible corporate actions been of greater necessity. We recognize we are a small player in the business world, but nonetheless we seek to be a global leader in sustainable business practices. We do not believe in the either-or proposition of environmental and social benefit versus profit. In fact, we strongly believe that our initial commitment to environmental integrity and social quality was instrumental in our ability to attract talented employees, develop close relationships with climate leaders, select reputable partners, and begin to build a customer base. 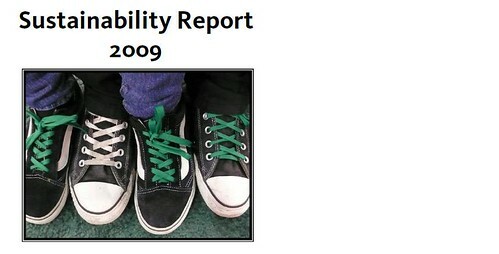 In conducting this sustainability report we are establishing a baseline for our environmental and social performance. In keeping with our core principle of transparency we will make this document public and will actively seek feedback from all of our stakeholders. As this report demonstrates, we still have a long way to go in reducing our impact and strengthening our social commitments. We know the challenge and pressures to live up to our sustainable principles will only grow as we grow. Nonetheless, we remain undaunted and as committed as ever to these principles. Let this report serve as our benchmark for evaluating our future performance, while helping to guide our growth. Please see the full color report here.